Ladies and gentlemen, are you ready for MUSE?? The British power trio are blazing a trail across the world in 2019 with their latest album “Simulation Theory”!! 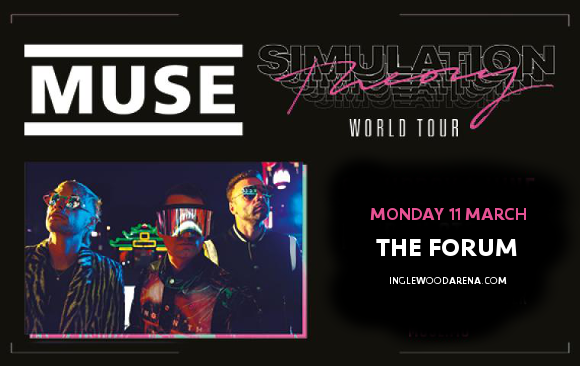 They’re bringing all the new songs to The Forum, Inglewood on Monday 11th March 2019 – do NOT miss this!! Grab your tickets NOW because they’re going to fly!! Formed in 1994 by Chris Wolstenholme, Matt Bellamy, and Dominic Howard, Muse started out as an alternative rock band with leanings towards a grandoise sound, which throughout the years, developed until they became one of the biggest stadium rock bands in the world. Their latest album, “Simulation Theory,” is inspired by science fiction and technological progression. And what is “that”? There’s only one way to find out – grab your tickets NOW to witness a concert that might just shake your perceptions of reality itself! !